Traveling on a budget because discovering interesting cuisine is the more important factor, I rarely was disappointed in my choices of accommodations. Punta Arenas was one of the exceptions. 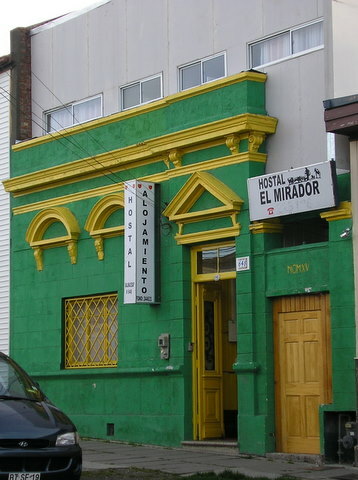 I chose a B & B, the Hostal El Mirador, Aveneda Balmaceda 638, based on proximity to the Plaza and the Ch$15,000 (US$26) per night rate. I made the reservation through an internet service which usually lists places with decent standards. The family was nice, but the building was not. It was clean, but shabby. The room included a private bath - tiny, with not even a sliver of soap - a sagging bed, walls thin as paper, dark with no charm. The advertised wi-fi connection did not work. The breakfast consisted of instant coffee, stale bread, margarine, mystery lunchmeat and nondescript cheese slices. Unfortunately, I don’t believe I simply made a bad choice because I sought out many of the lodgings in Punta Arenas recommended in the best guide books. Just looking at the exteriors I would not have wanted to stay in them - most were at least double the rate I paid as well. 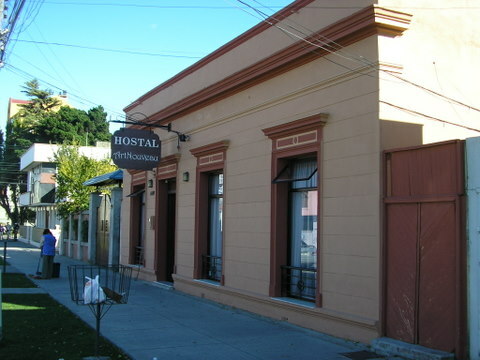 Based on a look at the lobby and dining area, Hostal Art Nouveau, Calle Lautaro Navarro, 762 and was unquestionably the nicest inn I saw and offered a nice breakfast buffet. Doubles are CH$31,350 (US$55). Otherwise there are several high-end hotels in the US$166 - $250 range.